* Minimal Initial Capital Outlay. * Short term lets available. * Reduced apportioned Business Rates inclusive. * Lighting, Heating, Cleaning/Window Cleaning, Internal and External Maintenance inclusive in Rent. * Full flexibility of staffing for your needs. * Full-time professional receptionist, to hold/divert/take messages. * Secure working environment for single members of staff in Regional Offices. * Central office with reception and administrator on premises. * No Depreciation on Equipment, Furnishings and Fittings. * Fully furnished to a high standard with office lighting, carpets, telephone, desk, chairs and filing cabinet. * Flexibility in office size with room for expansion subject to availability. * Audio copytyping, photocopying and all other Secretarial Services in house at competitive hourly rates. * Firm and polite debt management. * Conference facilities including lunches etc. 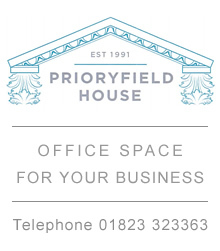 "The staff of Prioryfield House has played a vital part in the successful running of my business"